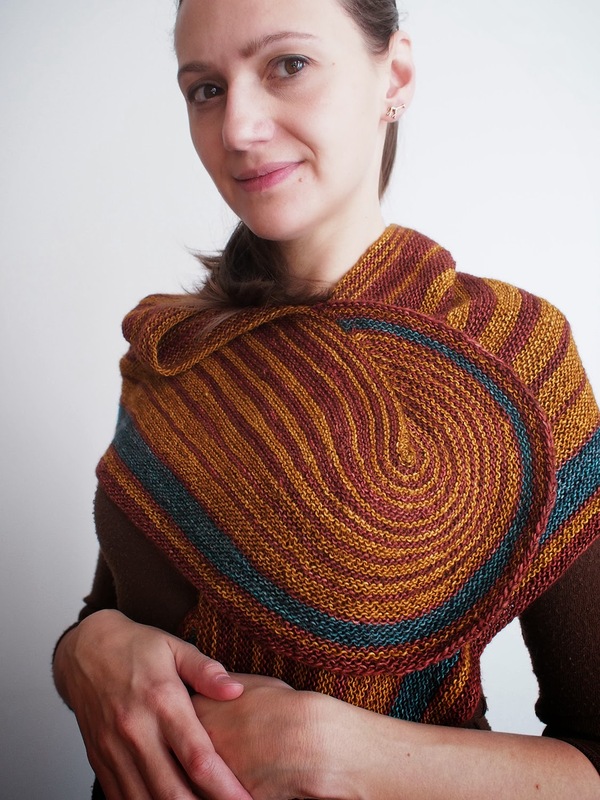 Are you thinking what I was thinking when I first saw this shawl? How on earth do you make that swirl, that gorgeous escargot?! I just had to know before everyone else, so I volunteered to test Atelier Alfa's pattern, fast as a bunny. 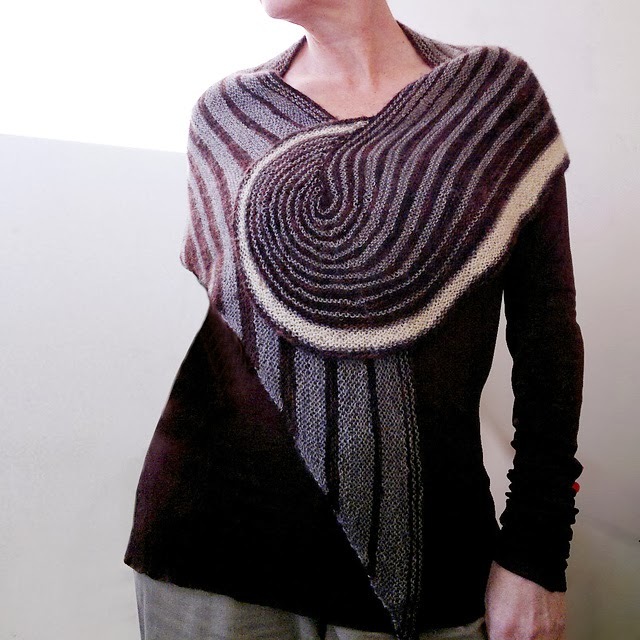 Fans of Al-fa's designs know that she knits with exotic geometry. 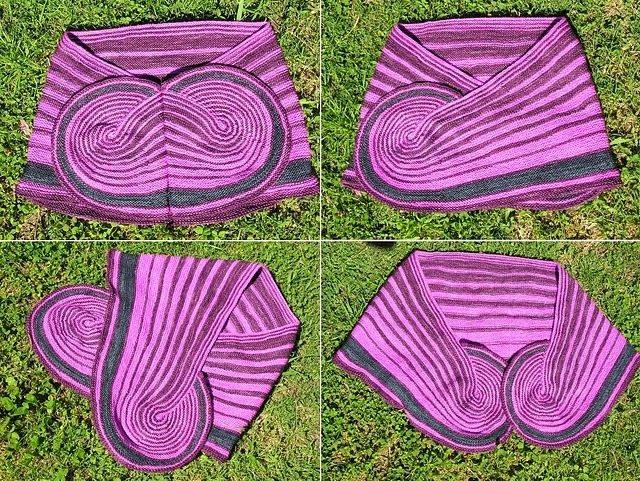 She uses shapes of all kinds to bend her knitting into forms that fit the body. Here is pasOdoble. 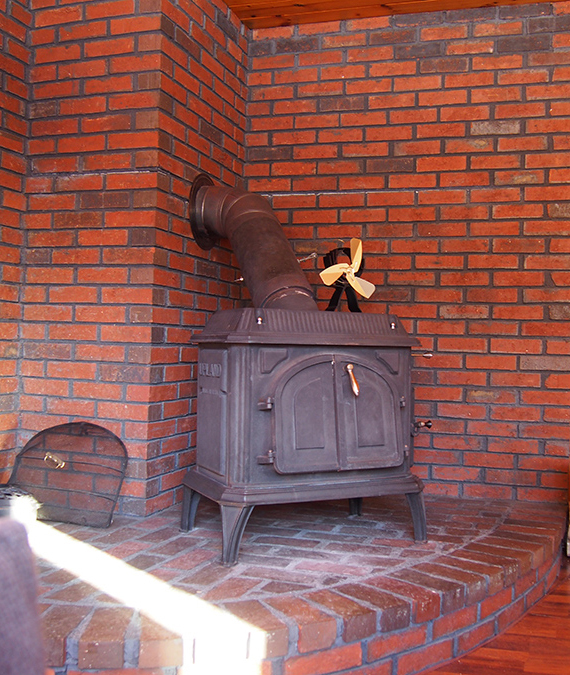 There is also a pasOsolo, which only has one escargot, and a pointed end on the opposite side. There are two other patterns I especially love. 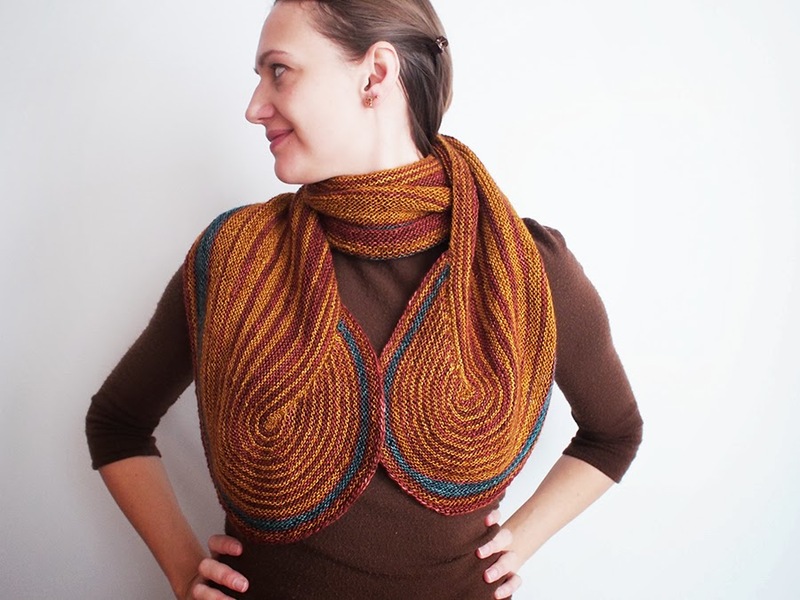 Linde, which I tested last year, is knit from the top down, starting with those beautiful spreading leaves. 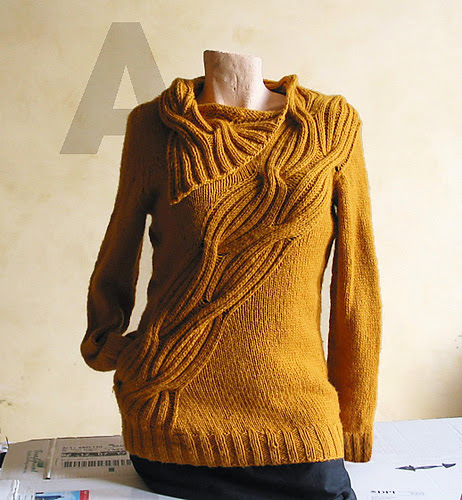 And then there is the Wrapped Pullover, which is high up in my queue. Yes, there is a pocket in that wrap! 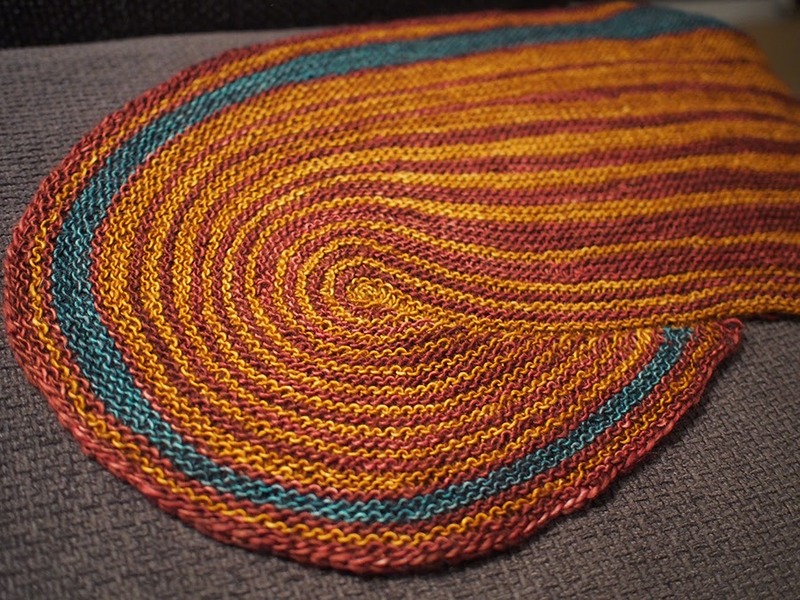 Not only was I attracted by the crazy swirl on the ends of pasOdoble, but I was also intent on doing a little stashbusting. 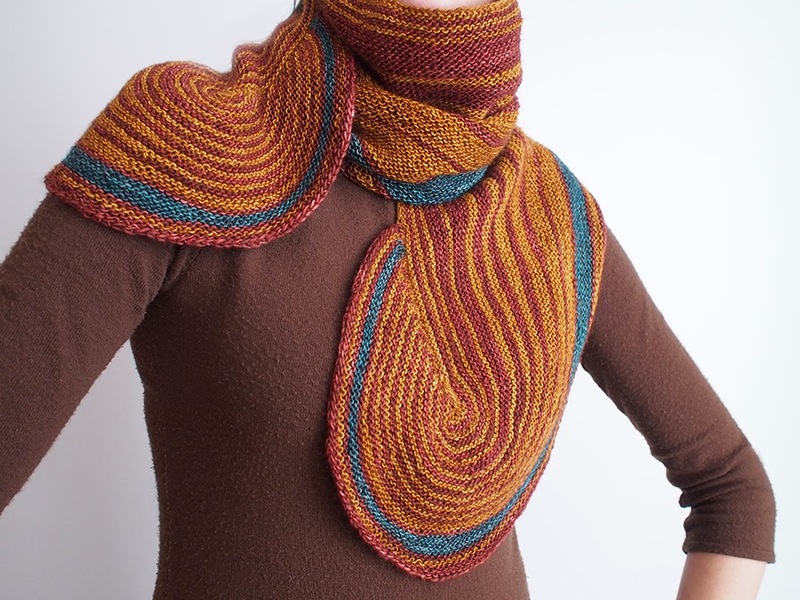 I had 3 colors of madelinetosh merino light that were a dream together. ...and then came in with Manor. The good news is you don't have to pick your third color until you are near the end! But I already knew it had to be blue. 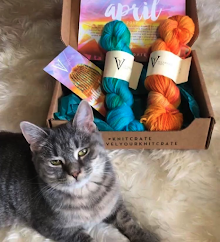 A note about madelinetosh merino light: It is a single-ply yarn, which is why it looks so damn fantastic in the tosh dyeing process for every color that exists. Buuuut single-ply yarns are dangerous for pilling. 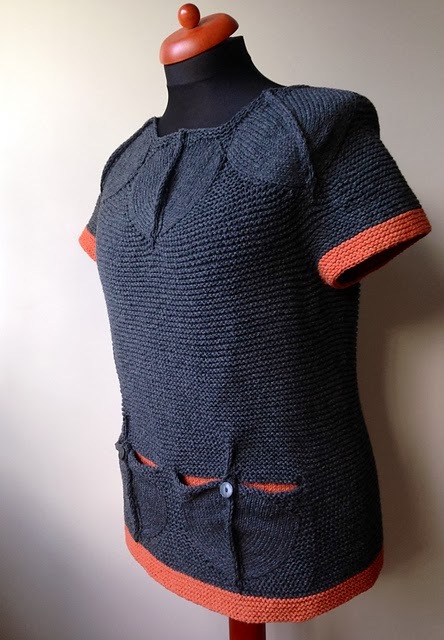 Well, I've made a men's sweater that has been worn over and over again... it has probably close to 1000 hours of wear by now, and I can say that it actually doesn't pill at all. It does 'fuzz'. It makes a mohair-y aura that is small and rather sweet (because man, do I hate those wonking pill balls that come from certain, ahem, other yarns). It doesn't need trimming/clipping/shaving, but you have to be aware of the fuzz. 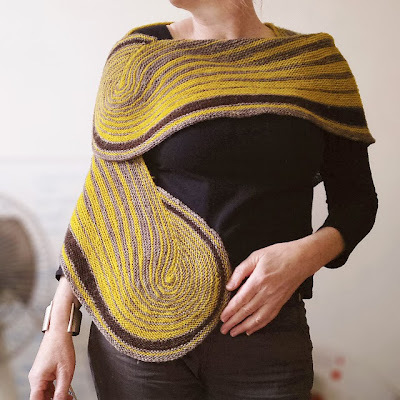 So, in the end, the wear and tear is totally acceptable, and I am now a number one fan of this rather unbeatably dyed yarn and use it all the time. So let's talk about that swirly snaily thing, shall we? It's really rather simple, and therefore ingenious. 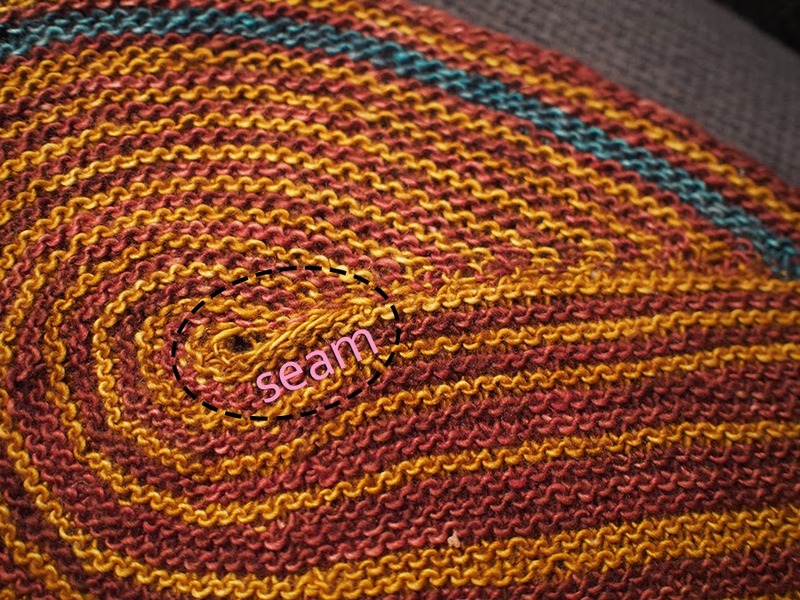 When you finish a row, you simply pull out a loop in your circular needle (much like magic loop), and pick up a stitch on the cast-on row. Yup. That's all. 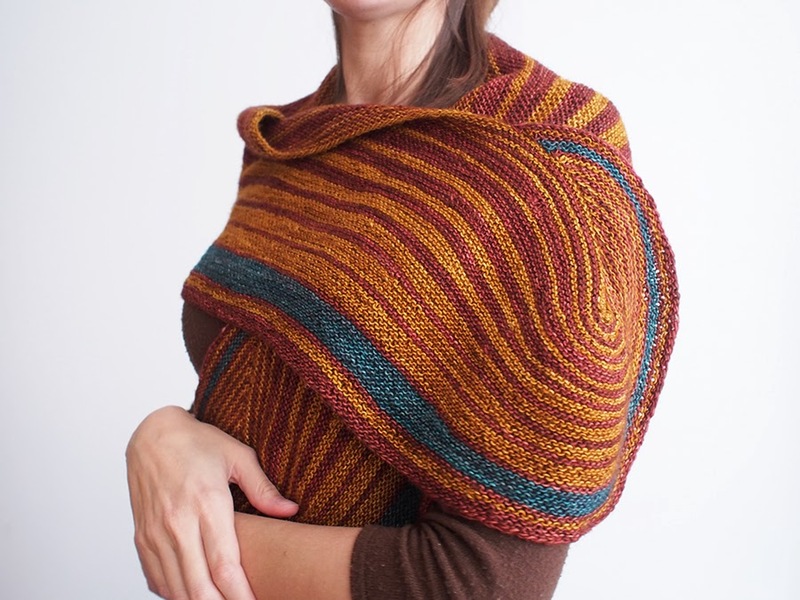 Increases help make the spiral (and shawl) bigger. Anne's patterns are excellently laid out, with many diagrams and notes on how to do her techniques. I highly recommend them. 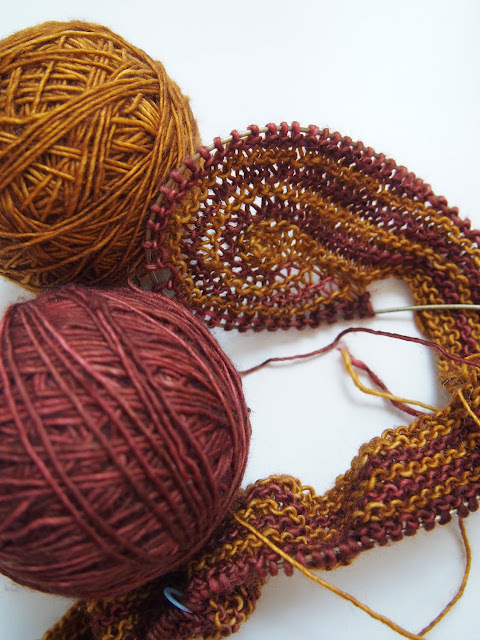 However, I did discover that if I followed the instructions, I got a different result for each end of the right side of the shawl. I started picking up this side in a way that showed the seam on the right side. This will only happen on the swirl that you pick up after finishing a wrong a side row. The other one will be perfect. 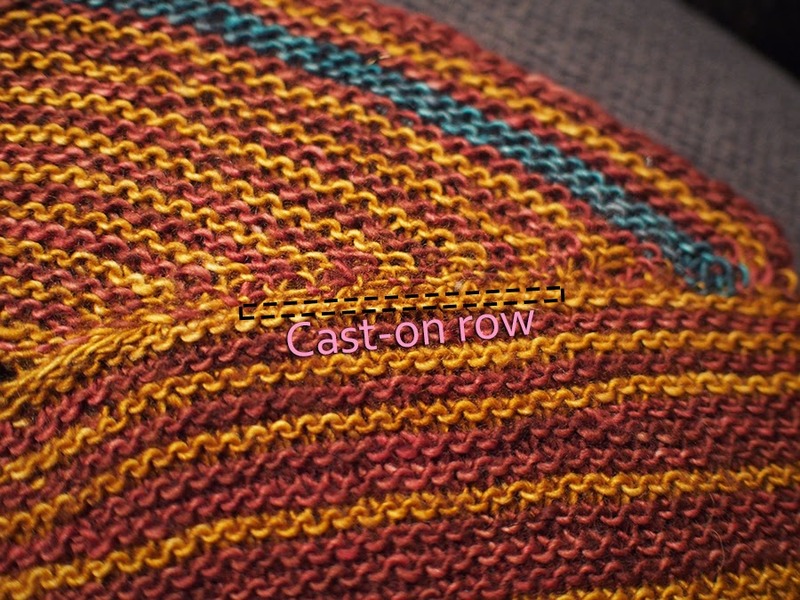 To fix this: after finishing a wrong side row, don't pick up a stitch directly facing you. 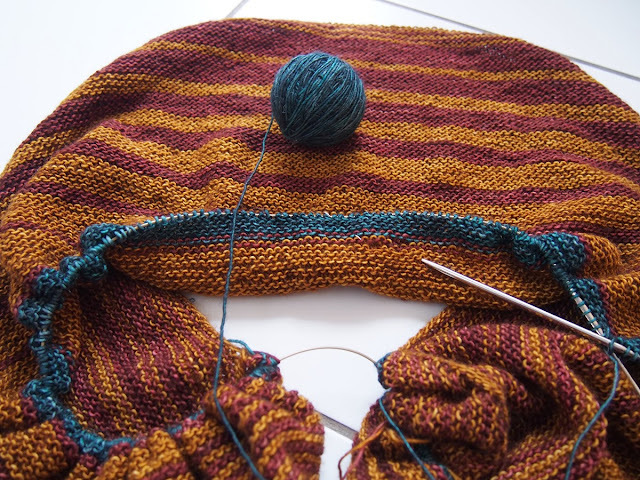 Instead, turn the work a little so that you are actually picking up a stitch on the right side of the work. This will properly turn the 'seam' to the wrong side. You can see how I corrected it later, but was unable to find a nice way to hide the original seam. 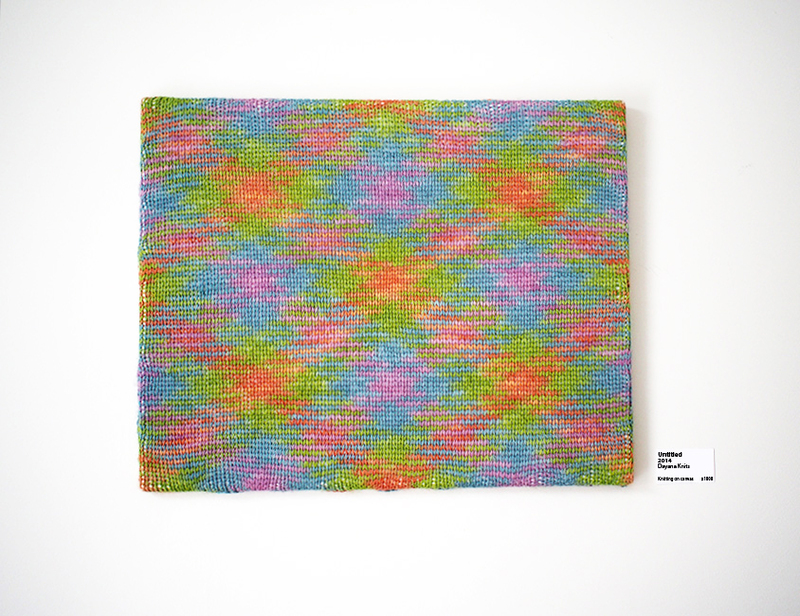 Oh well, it's my "Hand-Knitted" stamp! 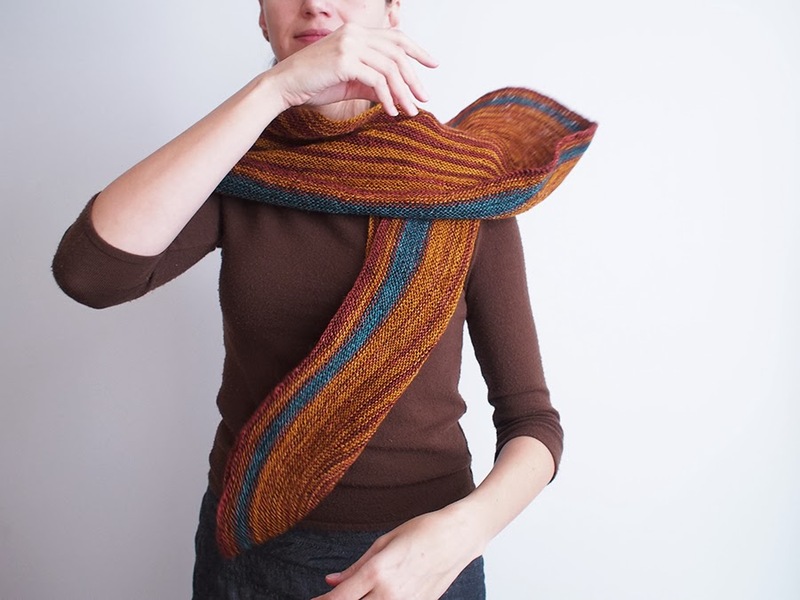 As you can see, this shawl is versatile, and can be worn in many different ways. Check out lynx-ical's pasOdoble summary! All in all this was a fun and mightily addictive project. 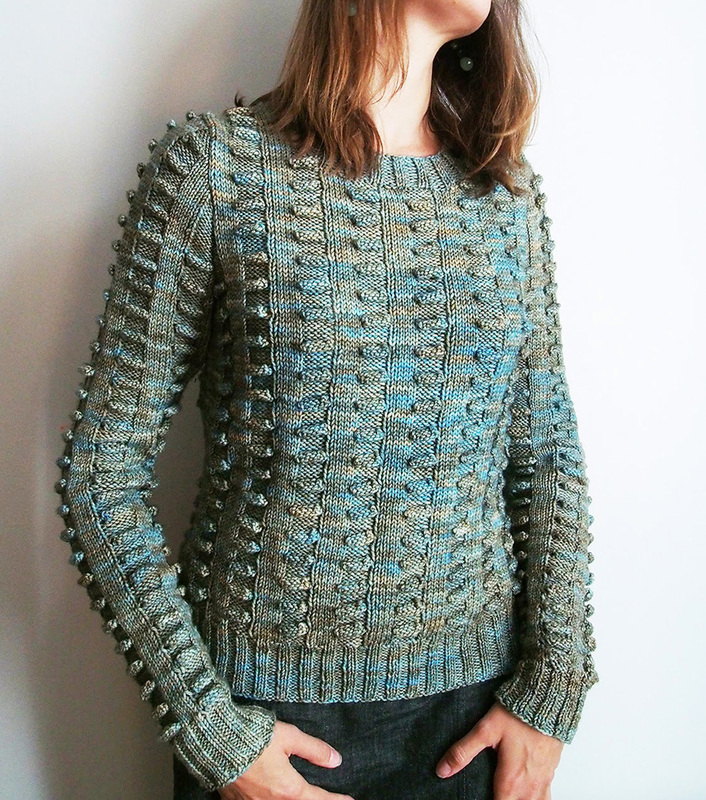 It's also a great introduction to Atelier Alfa's pattern style, if you'd like to start simple. 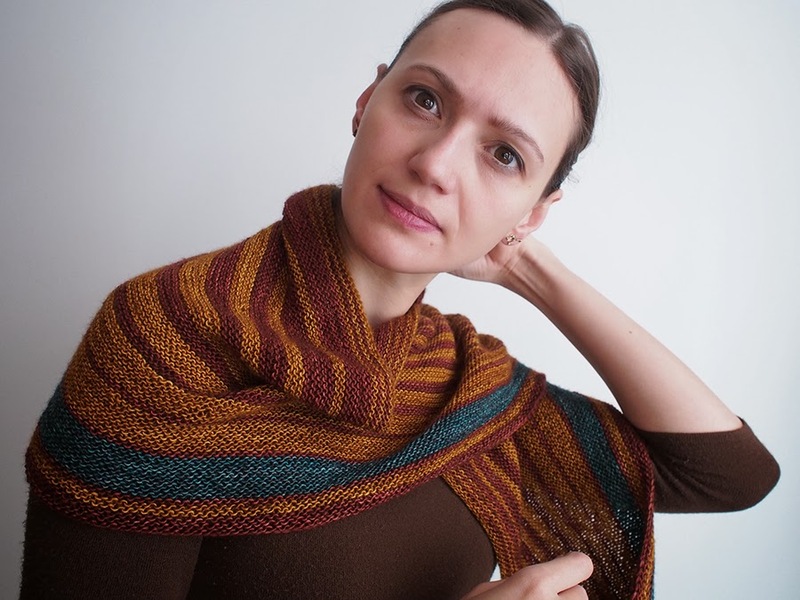 Other than the escargot, the rest of the shawl is simple garter stitch and increased using short rows. 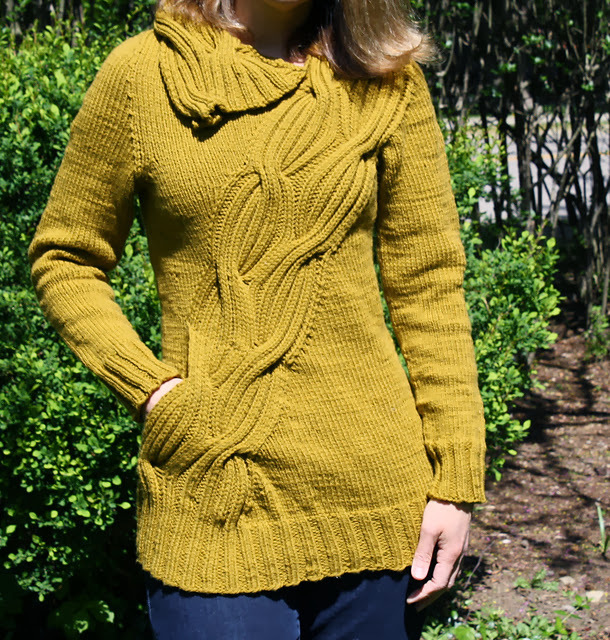 Check out the Alfaknits group on Ravelry to see her upcoming designs, participate in test knits, and learn when there are upcoming pattern sales. 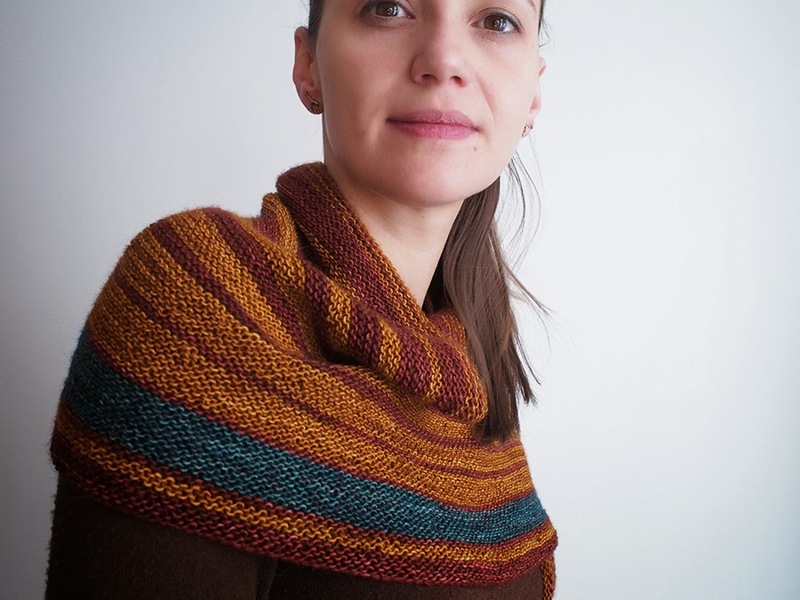 Dayana, this shawl was made for you, and it is gorgeous on! Those colors really bring out your eyes and skin tone to perfection. 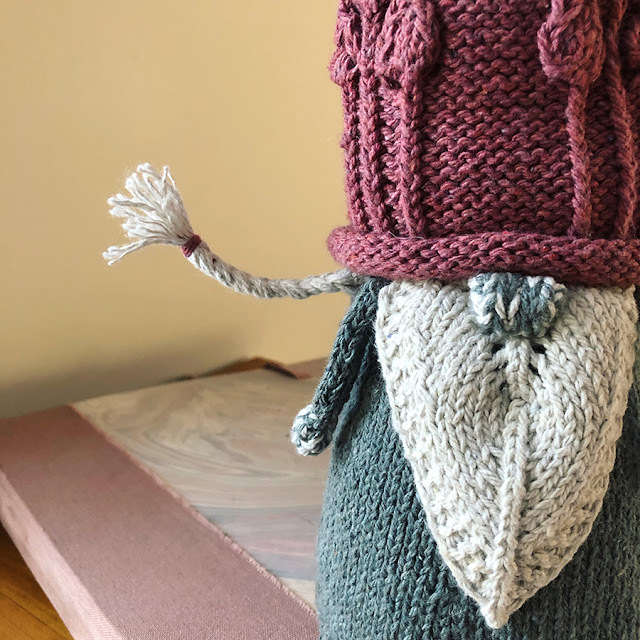 It is a fun and ingenious design, which must have been very amusing to knit! What a beautiful design. I love the concept of these rounded shapes. I wonder if there'd be a way to use this as a way to shape shoulders... It's also nice to see how she really spent time exploring the concept and created more than one design. Just stumbled on your blog via Rav and I am so glad I did. 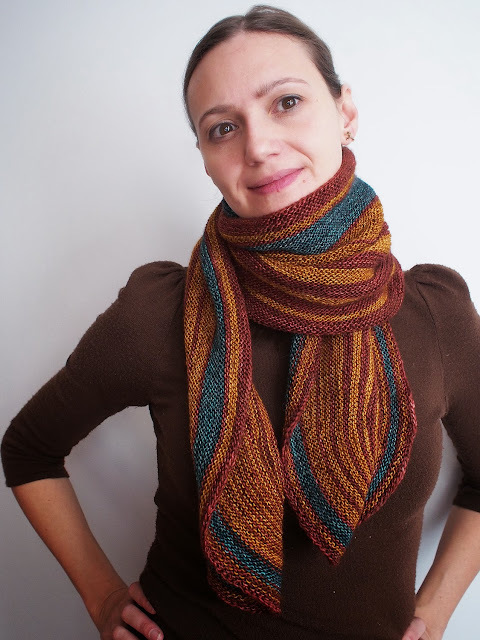 This pattern is just amazing. I agree that the colors you chose are brilliant i this design.